The duties of a Neighbourhood Crimewatch will offer very little change in the lifestyle for those involved. Rather, they provide a means to meet your neighbour, as well as a vehicle for making your community a safer place to live. For help call TTCIC Secretariat 637-6966, your nearest police station or the Ministry of Community Development and Gender Affairs. Campaign your neighbourhood seeking votes from neighbours who are interested in participating in the programme. This may be done by contacting them in person, or distributing brochures and questionnaires (available at the TTCIC). After this has been completed and you are confident you have neighbours interested in participating in a Crimewatch programme, arrange a meeting for your group in a venue appropriate for hosting a community meeting. Contact the TTCIC or the Community Police to arrange a mutually agreeable date and time for the meeting. Flyers and letters may then be prepared and distributed. The Police Community Relations Officer and TTCIC may assist you by supplying maps outlining your Neighbourhood Watch boundaries, dividing your area into blocks and suggesting an agenda. He/she may also bring brochures and resource material to the first meeting. At the first meeting the Police Community Relations Officer and a representative from the TTCIC will explain the Crimewatch concept, home security and the method of reporting incidents to the Police Force. This meeting will also be used to identify Block Captains, Street Representatives and the Committee Executive. Hold regular Neighbourhood Crimewatch meetings, 3 to 4 times a year (more if necessary). Assist in welcoming new neighbours to the area and introduce them to the programme. 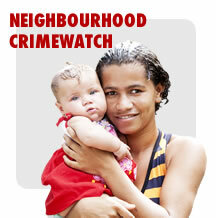 Encourage neighbourhood participation in the Crimewatch programme. Serve as liaison between the Crimewatch members and the Community Police. Distribute information from the Police Service, Zone Leader or Steering Committee to the citizens. Attend Crimewatch seminars or workshops which may be conducted from time to time. Inform members of Neighbourhood Crimewatch techniques, such as how to observe suspicious activity, what to observe and similar crime prevention techniques. How to identify a criminal or suspicious activity. The procedure to follow when reporting this activity to the police. After they contact the police they should contact their Block Captains who record the information in their weekly report to the Community Police. If a squad member notes suspicious activity but it does not warrant a call to the police, they should pass the information on to their Block Captain. He or she will record the information in their weekly report to the Police Co-ordinator, and in the event of an actual crime this report may serve as a starting point for the police to conduct an investigation. Squad members will receive instructions on home security and will be encouraged to follow through on the necessary security procedures. When a squad member goes on vacation they should inform their Block Captain or Assistant Block Captain, to ensure that special attention is given to their home, while they are away. The Block meetings provide an opportunity for the squad members to discuss particular concerns, as well as the types of crimes being committed in their community. Interact with the community and create a shared goal of understanding each other’s problems. Increase harmony and cooperation between the police and the community in the fight against crime. Promote an understanding of the police role in the community. Once the programme has started it is the primary objective of the members to run and maintain their interest in it. It is important to note that the need for a Neighbourhood Crimewatch does not diminish when there appears to be little crime in the area. Invite the police unit that is responsible for your area to neighbourhood visits and make them part of your neighbourhood activities. Vigilance would assist the police in protecting your neighbourhood but other methods such as newsletters, meetings and social gatherings can be utilised by the community to sustain interest in the Neighbourhood Crimewatch programme. * Example: I am Gillian Sookoo of 16 Rose Street, a member of the Valsayn Crimewatch programme. A suspicious person is prowling around my neighbour’s house at 14 Rose Street. Remain in contact with the Police Dispatcher until all necessary information has been obtained. Do not personally confront the situation. Await the arrival of the police. When reporting an incident to the police you may be asked to repeat the address. This is to ensure that the address is correctly understood. At the time, as you relay the information, a car may be dispatched to the scene. Any additional information will help the police to determine the type of emergency equipment required for the situation. If the crime is in progress, e.g. the burglar is still in your house, your call will be answered immediately. If the crime has already been committed, e.g. you have come home and found that your home has been burglarised, a slower response should be expected. CRIMES IN PROGRESS RECEIVE FIRST PRIORITY! All other calls are answered after that.